Whether it’s about church or chocolate, people all over the country are getting ready for the Easter celebration. This weekend we come together with family and friends to celebrate Easter, a holiday of the Christian Church celebrating Jesus’ Resurrection from the dead. It is a movable feast because it does not fall on the same day every year. For the Christian Church, Easter is really an entire season. Christians prepare for Easter during Lent which is the 40 day period leading up to Easter Sunday. During Lent, Christians take this time for penance and reflection. The day before Lent is what we call Mardi Gras or Fat Tuesday. Mardi Gras is the last day of food and fun before Christians begin Lent and fasting. The week before Easter is called Holy Week and includes Maundy Thursday, which observes Jesus’ last supper with his disciples; Good Friday, which recognizes the day of his crucifixion; and Holy Saturday, which focuses on the transition between the crucifixion and resurrection. The 50-day period following Easter Sunday is called Eastertide and includes a celebration of Jesus’ ascension into heaven. However, Easter was celebrated by the pagans long before it became a Christian day of celebration. 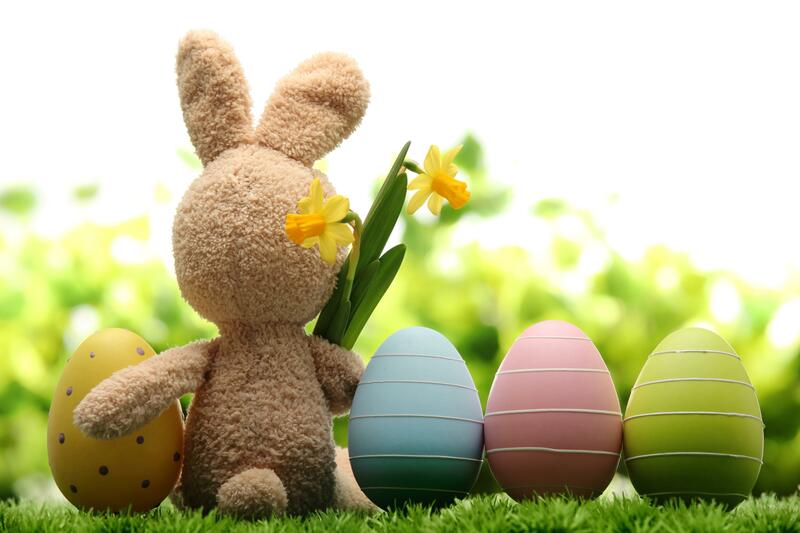 Over 90 million chocolate bunnies and 16 billion jelly beans are produced each year. 600 million are usually sold in the U.S. during the months of March and April. When taking a bite into a chocolate bunny, 76% of Americans prefer to bite off the ears first, 5% eat the feet first and 4% eat the tail first. Eggs have been seen as ancient symbol of fertility, while springtime is considered to bring new life and rebirth. Americans spend $1.9 billion on Easter candy. That’s the second biggest candy holiday after Halloween. Wishing you a bright and happy day, filled with the nicest things that spring can bring. Happy Easter!